Wooden tablets aren’t the only priceless treasures to dot this desert oasis. Temple One of the Toop Baruch Mound may be the smallest temple in the world. It was discovered in Damagou Township. As a stop on the famed Silk Road, the little temple has been an astonishing discovery to the world. Measuring 2 meters long, and 2 meters wide. It’s just enough space for one monk to perform his prayers. Toop Baruch Mound means ’big mound’ in the Uygur language. Before it was excavated in 2000, it was indeed a big mound with rose willows growing on it. Yet today, it’s considered one of the best preserved Buddhist temple relics in Taklamakan. Shi Yan, director of Qira County Cultural Relics Institute, said, "Temple One was a family temple, privately belonging to a noble family among the people. From it, we can see how popular the Buddhist culture was at that time. " The finding of Temple One happened almost by accident. Wu Xinhua, archaeological team leader of Chinese Academy of Social Sciences, said, "Several kids came to gather firewood, and they discovered the mound had murals and rooms. There must be treasures underneath", one of them said. Then they kept digging. Finally they found a broken Buddha." Some of the walls in Temple One are less than 2 meters high. On walls like this, the archaeological team has stripped away all dust and mud to reveal a complete mural of the North King God. This god was in charge of fortune and was worshipped by every family in the ancient Hotan area. The archaeological team has also been searching for signs of Temple One’s former residents, like the remains of the noble family. But so far nothing has been found. Shi said, "Since there are temple relics, there must have been people living here. The remains of those residents should have been spotted. But so far we have found nothing." Although no houses have been found, more temples were revealed. 50 meters away, Temple Two and Temple Three were discovered, linked together by a corridor. Unlike Temple One, they comprise a grand worshipping place for the public. 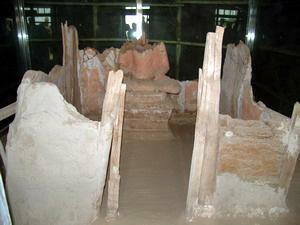 Radiocarbon dating technique shows the three temples all date back to the Tang Dynasty, about 15-hundred years ago. Yet whether the smallest temple and the two grand ones are linked, and also by a corridor, remains a mystery for now. Chinese archaeologists are now carrying excavations in the Taklamakan Desert in northwest China’s Xinjiang Uygur Autonomous Region. The desert is the world’s second largest shifting sand desert, covering an area of about 330,000 square kilometres. Archaeologists have recently found a large number of ancient buildings and Buddhist relics in the Damagou area of the desert. Let’s take a closer look at what has been found over several decades. Zhang Yuzhong said, "The ancient city of Loulan was the capital of Loulan country in the Han Dynasty. It was built earlier than Dandanulik. We believe that the two discoveries mark a milestone in the archaeological history of Xinjiang."